The Information Commission (ICO) has ruled that 'common sense should prevail' over Google Street View, saying that the photographs of people are no more troublesome than faces in the crowd on Match of the Day. Responding to a complaint by Privacy International, the Information Commisioner's Office (ICO) put out a statement in which Senior Data Protection Manager David Evans stated that a 'pragmatic and common sense approach' was needed. "Any images of people's faces or number plates should be blurred," said Evan. "We emphasised the importance of blurring these images to protect people's privacy and limit privacy intrusion. Google must respond quickly to deletion requests and complaints as it is doing at the moment. We will be watching closely to make sure this continues to be achieved in practice." Evans goes on to point out that images of the public, used without consent, are commonplace in the media, and that nothing would be served by 'turning back the digital clock'. "It is important to highlight that putting images of people on Google Street View is very unlikely to formally breach the Data Protection Act," adds Evans. "Watch the TV news any day this week and you will see people walking past reporters in the street. Some football fans' faces will be captured on Match of the Day and local news programmes this weekend – without their consent, but perfectly legally. "In the same way there is no law against anyone taking pictures of people in the street as long as the person using the camera is not harassing people. Google Street View does not contravene the Data Protection Act and, in any case, it is not in the public interest to turn the digital clock back. 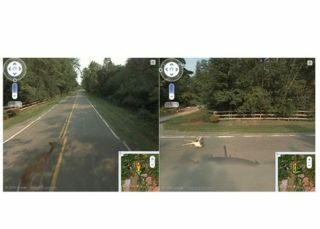 "In a world where many people tweet, facebook and blog it is important to take a common sense approach towards Street View and the relatively limited privacy intrusion it may cause." Google has issued a statement over the ICO response, stating that it is 'pleased'. "We are pleased with the ICO's statement. We took care to build privacy considerations into Street View from the outset and have engaged with the ICO throughout the development process," said Google. "Already millions of British people have benefited from Street View, whether to get driving directions, find local businesses, or explore a tourist destination. "We recognise that a small minority of people may not wish their house to be included in the service which is why we have created easy to use removals tools."